A hollow form or cavity into which molten plastic is forced to give the shape of the required component. The term generally refers to the whole assembly of parts that make up the section of the molding equipment in which the parts are formed. Also called a tool or die. Moulds are typically constructed from hardened steel or aluminium. The choice of material to build a mould is primarily one of economics. Steel moulds generally cost more to construct, but their longer lifespan will offset the higher initial cost over a higher number of parts made in the mould before wearing out. 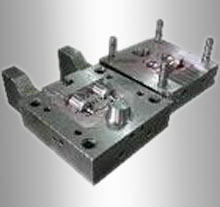 Aluminium moulds can cost substantially less, and when designed and machined with modern computerized equipment, can be economical for moulding hundreds or even tens of thousands of parts. Materials commonly used are beryllium copper, and kirksite.